Now this is a story all about how my life got switched, turned upside down and I’d like to take a minute, just sit right there. I’ll tell you how I became the owner of some storage under the stairs. Sorry, blatant rip off of Prince of Bel Air there, but my new under stair storage needed something a little more exciting to introduce it other than, nice shelves in a small area. When we moved into our house, we inherited a space under the stairs that needed a bit of love and attention. We mainly used it for throwing our shoes under and hanging up our coats so it always looked a little untidy and unkempt! When we finished our kitchen renovation, we asked our builders to put an under-stair cupboard in to hide away all the outdoor paraphernalia and firmly keep a door shut on it. Fast forward 18 months later and my sofa of dreams was being delivered to much fanfare. The living room and hallway had been tidied and I eagerly awaited its arrival. So, imagine my huge disappointment when we realised, we couldn’t remove the old and frankly awfully huge and bulky sofa from the room. How? I asked. We got it in there?! But I soon realised that we had the cupboard put in after moving all the furniture into the living room and now couldn’t manoeuvre it back out. The delivery men were about to take my new sofa away and I had to say NO! Over my dead body! The sofa stays, we will find a way. The delivery men took my signature and quickly made their escape with my new sofa in the hallway blocking everyone from either coming in or leaving the house. A quick phone call to my husband later, our carpenter friend popped over to our house in the early evening and began to rip out our under-stair cupboard. However, we still couldn’t remove the old sofa so the only thing for it was to saw it in half! Finally, we managed to remove it and the new sofa easily fitted through the doorway and into it’s new home. With a hallway full of dust, a sawn in half sofa on our front drive and coats piled up on the floor, I sat down that night on my comfortable new sofa and set about trying to decide what to do with the new open space in the hallway. Here are a few ideas and inspiring Stairwell spaces that I came across whilst looking on Pinterest. I love the contrast of this dark custom built library/bookcase but knew we probably wouldn’t have the room for the “reading area” of this mini library and part of the space is taken up by a cupboard containing our fuse boards! This fabulous seating area looks cosy and inviting and perfect for somewhere to curl up with a book. Bit it wasn’t very practical for our house when we already have enough seating areas and really needed somewhere to store our coats, bags and shoes. I really liked the idea of creating a small office space in this area, but the hallway gets a huge amount of traffic and we already have a small desk space out of the way in the back of the play room so again, it was a little impracticable. This is perfect and exactly what we probably needed, but I knew that with a busy household of four, this would look messy and out of control in no time! 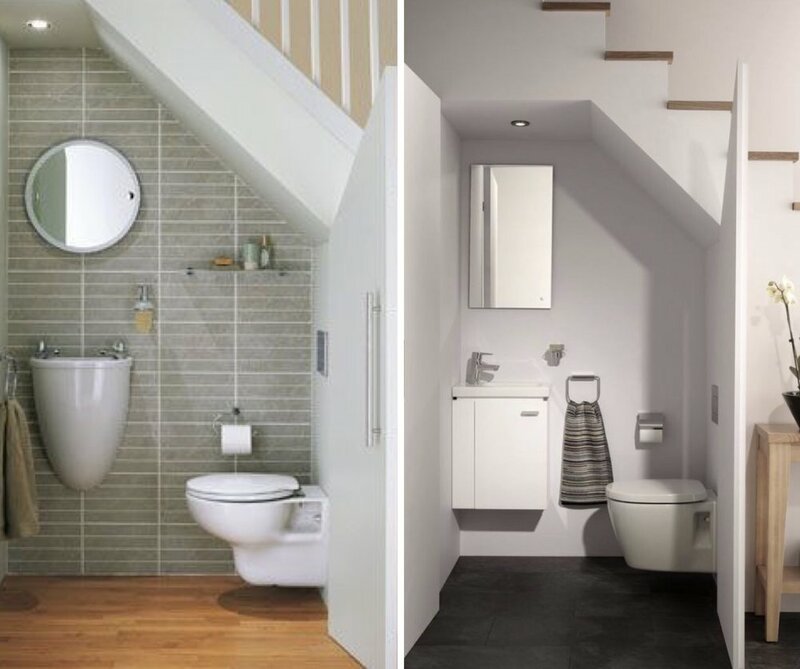 This is a superb use of space and I have seen it done in many houses where there is no room for a downstairs toilet. But we already have a small downstairs bathroom so although I would have had lots of fun designing this, it was unnecessary. After looking at hundreds of images of under stair storage ideas, this was actually one of my favourite uses. 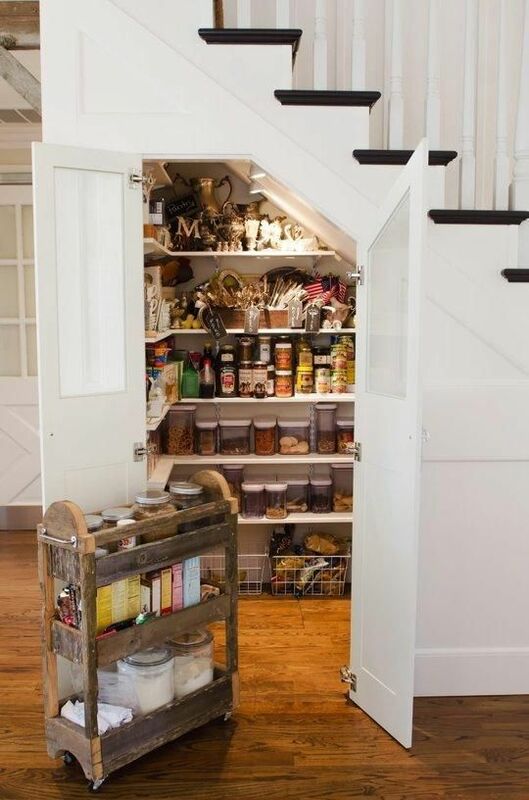 Under the stairs does provide a huge space to have multiple shelves and storage solutions so where better than to put all your kitchen wares and groceries if you have a small kitchen? 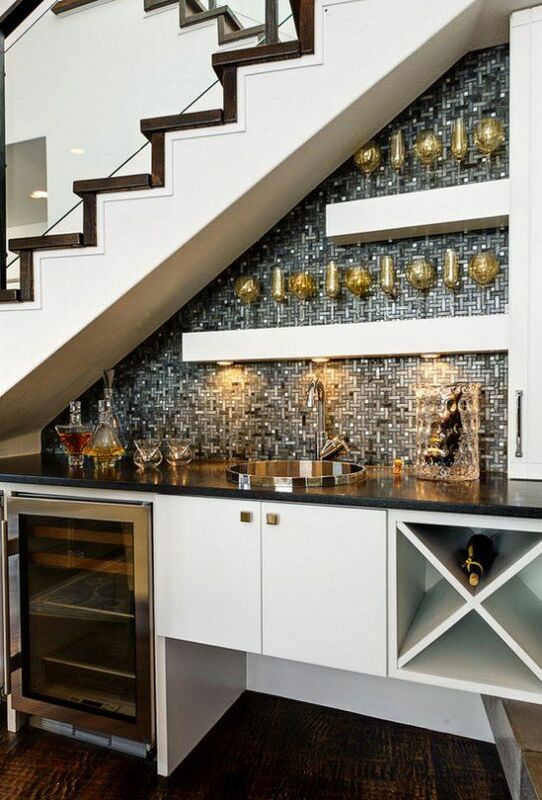 Especially if the stairs are built into your kitchen space. But again, we have ample storage in our kitchen so it was something that was not needed. I have seen a lot of images circulating on Pinterest with these pull-out drawers and cupboards containing all your shoes, bags and coats and this probably optimises the most of your space as they are custom made. But as we are hoping to sell our property soon for another renovation, I felt this was quite a costly way to update the stairwell. Again, I love this idea! 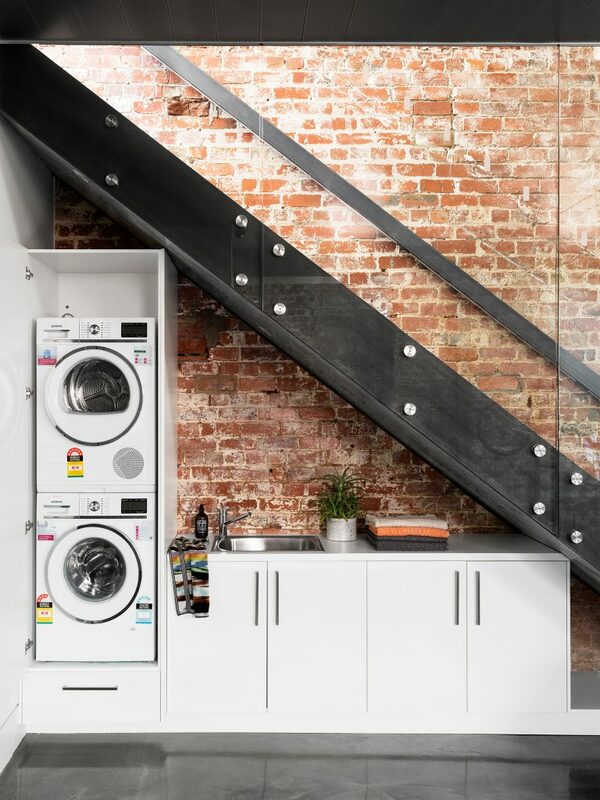 It frees up so much space in your kitchen if you don’t have a utility room and can become a designated space just for your laundry. It would provide an added extra of making your hallway smell of fresh linen consistently and you could include sliding doors to hide it away when not in use. Thankfully we have a utility room, so again, this wasn’t needed. Which leads me on to one of my favourite under stair images ever. When I grow up and learn not to quaff down all the booze in my house in one night, THIS is what I would have! But for now, it needs to be a space to store shoes! Who knew that such a small space could provide so many choices and inspiration? As much as I was tempted with an inbuilt bar or wine cellar, I knew I had to be practical and go with something that could keep our coats, shoes and bags hidden out of view, but also have the ability to display books and plants to keep the space looking contemporary. So when I saw this image on @apartmenttherapy I knew this was exactly what we were after. We asked the same carpenter friend to come back and we hastily drew up a plan for the shelving with paper and pencil and ordered all the wood and materials needed to tidy up the area. It took a whole weekend to put up the bespoke shelves due to there being a lot of pipes and holes in the existing wall. We were then left with an unpainted and empty shelving unit, so the next decision was what colour to paint it and what to fill the shelves with. I decided to go with white shelves and a wallpapered back ground to make it more interesting. I had some blue and white geometric wallpaper left over from B & Q from an upcycled project so decided to go with this. When I first posted these shelves on my Instagram stories, a lot of people questioned why I didn’t wallpaper the back first before the shelves were put in, instead of having to measure out and paste each individual section. I found this way easier as, if I’d wallpapered first, I’m quite a messy decorator and would have ended up with white paint splashes everywhere! In hindsight, it would have been easier to paint the shelves white before fixing them into place but as ever, I was undecided as to what to do when the shelves were assembled. We also had a cupboard to the right of the shelves which contains all the fuse boxes and the doors were painted with black chalkboard paint. I white washed the doors and then used Farrow & Ball Stiffkey Blue to match the blue of the wallpaper, finishing the doors off with some new knobs. The last job was to find some jute or wicker baskets that would fit on the bottom shelves and would be big enough to contain all our shoes, bags and winter gear. 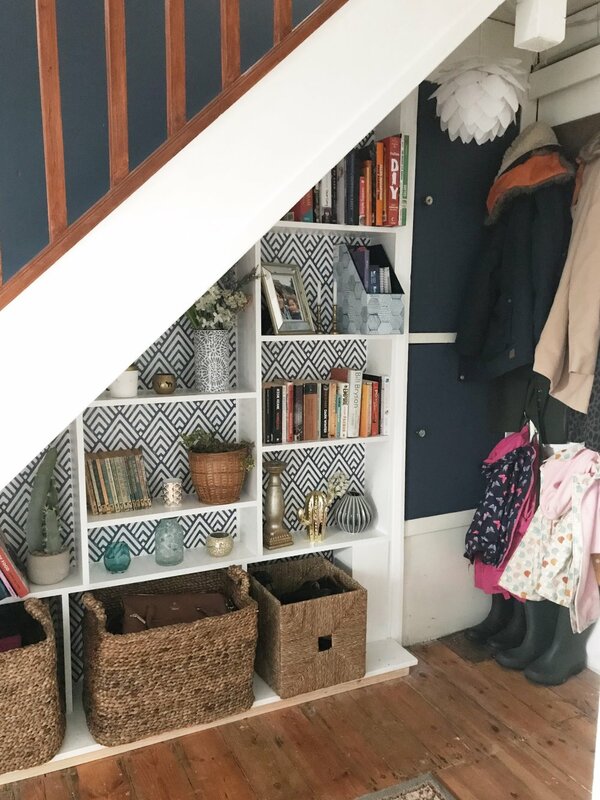 Originally, I had planned to put some IKEA wicker baskets along the bottom which I already had, but the gaps were too large and they looked a little odd so I found some baskets from La Redoute that fitted so perfectly, it was like they were made for the space! Finally, it was a case of filling the shelves with books, plants and other items and finding a light shade for the bulb which hung under the staircase and the area was complete. We had several coat hooks put up to the right of the cupboard and all the shoes and bags were put in the baskets which completed a practical, but contemporary use of our under-stair area. I am extremely pleased with the results and actually quite glad of the drama of trying to get our new sofa into the living room!